Helping elementary schools replace harmful recess patterns with new approaches that help children grow socially and emotionally, not least by helping one another grow. Lauren McNamara, armed with new measures and data she developed, is persuading and helping elementary schools replace harmful recess patterns with new approaches that help children grow socially and emotionally, not least by helping one another grow. Building off of several years of rigorous prototype testing and of associated research, Lauren is helping everyone grasp that recess is, first and foremost, a social space where friendship and social interactions transform a young person’s trajectory— for good or ill. And she is persuading elementary school staff, parents, students, and policymakers to shift to a far better model. Lauren’s approach equips stakeholders with the skills and mindsets to create the concrete culture, role models, activities and physical space necessary to support young people in building healthy relationships that lead to lifelong competency, well-being, and quality of life. Her approach uses social patterning to create a positive recess experience where the nature of the interactions cumulatively foster significant life advantages for the child. Lauren has co-designed customizable and ready-touse training programs and resources for schools with students, teachers, and principals. Volunteers and regional recess coordinators are provided to schools alongside training guides with examples, templates, games, and best practices that can be adapted to each school’s specific needs and resources. The approach includes volunteer role models on the playground who correct negative behaviors and promote compassion, social interconnection and physically active play. Because one of the first ways humans learn to learn is through mimicry, volunteer role models coming from the community, such as a local university’s cooperative students, help to establish these new habits and norms for recess time. Lauren’s design also ensures that recess includes activities pertaining to different student interests and can adapt to diverse school’s spatial layouts. Also, activities rotate on a ten-week basis, which keeps children interested and engaged in meaningful and active play. Evaluations show that Lauren’s adaptable remodeled recess does promote student well-being. This research shows significant increases in enjoyment, sense of belonging, acceptance, positive friendships, and activity engagement for all students— factors that are well-understood to have cascading effects on academic, family and community life. Her grassroots initiatives with schools and school boards come paired with strategic national partnerships that enable her to move policy makers towards broad commitment to making recess a reliably key way of advancing children’s ability to contribute and their wellbeing. 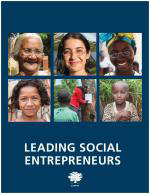 Lauren' s story appears in the 2018 edition of "Leading Social Entrepreneurs" which features a selection of just a few of the Ashoka Fellows recently brought into the largest global network of social entrepreneurs. The LSE presents some of the newest innovations by leading social entrepreneurs whose ideas are changing the way things are done all over the world.